When judging, I occupy myself with studying handling methods. There is this new thing that people are doing where the handler shakes a fist at a jump. I’m presuming that the signal is for the dog to collect and wrap the jump in a neat turn back to the handler. I’m all for something new. I always have been. It’s fairly easy to ascertain if a handling device actually works. Did it communicate to the dog and deliver the desired results? Did the dog collect? Did the dog wrap neatly back to the handler? Or, did it cause the dog to drop the bar or earn a refusal in the face of it? So far as I can tell, the “fist” thing at a jump is as likely to succeed because of what the handler does with his body as with his hand. Rotating slightly back to the dog indicates a turn. Making the presentation with the counter arm does the same. Facing back more fully to the dog (back-peddling to support the forward movement) is a favorable cue for the dog to collect for the jump. At any rate, I measured the success rate of the “fist” at a cool 50% which isn’t terribly impressive, don’t you know. But I’m reminded that like the game of Zoom where a clear message is whispered from ear to ear that the spoken phrase at the end of the line mightn’t much resemble the phrase that began the whispering. And so the teaching of whatever innovator is out there teaching this “fist” thing is most likely obscured by the sloppy passing on of the technique. What I want to know, of course, is this something that is supposed to be intuitive to the dog? Or, is it something that has to be taught to the dog? If it is not intuitive… why the heck does it have to be a fist? Couldn’t it be a hippy peace sign? And, if it is intuitive, why doesn’t it work to a greater extent. I’m sure somebody will step up to share the “science” with me. The Ketchker is getting to be more common in competition. This is a movement that I began studying and teaching 12 or 15 years ago. I called it the “Flip” and defined it as a combination movement, Front Cross to Blind Cross. Unfortunately in the present incarnation it is used in a very narrow and one-dimensional context… solely as a wrapping movement at a jump. The world at large hasn’t discovered the application of the Flip out on the flat. And, there are several dandy applications on the flat. Note that like the RFP the handler’s lead in the Flip/Ketchker resolves to the side on which it started. Unlike a simple cue for the dog to collect and wrap (as in the “fist” thing or a simple “backy-uppy”) the handler doesn’t really want to change leads. So it was natural, predictable, and logical for the movement to come into common use. I have for a number of years catalogued handler movements in agility and tried very hard to understand how they influence the dog’s understanding of the direction of the course. Since it is the handler’s job to direct the dog it makes some sense that we should understand movement as a form of communication with the dog. Indeed, movement surpasses verbal speech in nearly every way. This is a radical notion in today’s game. It seems so obvious to me that I am always surprised when I run into the brick wall of incomprehension and, frankly, belligerent denial. Carole Schlaes wrote this comment: “Since you still have 27 days or so to go in this latest endeavor, can one of those days be a tutorial on the Flip?” I suppose that I’m obligated to do so now. I’m pleased to call this a “Mitchell” Flip one last time, just to acknowledge how I first began to study this movement. In a class back at Dogwood many years ago we were doing an RFP exercise. Once of my students did this thing that clearly was not an RFP. But what struck me on the moment was that a) it worked, and b) it was quite elegant. Mitchell has moved on to a Border Collie and training with someone who disdains handler movement as a form of communication with the dog. So the movement really doesn’t need to be named after him. 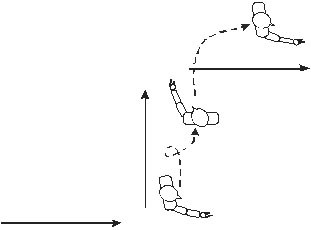 The Flip is a combination movement, Front Cross to Blind Cross. It is the poor second cousin to the RFP, and can be used instead of the RFP in many situations. In one way the Flip is superior to the RFP. The Flip allows the handler to remain in motion, and to get going, when the RFP grinds the handler to a halt. The Flip acknowledges three lines and creates two distinct corners in the dog’s path. Note that the first movement is a Front Cross, which starts towards the dog. But the handler does not want the dog to come all the way up on the new lead hand. Before the dog can actually catch the handler, the handler will do a Blind Cross, continuing to turn in the direction started with the Front Cross yet moving in a direction corresponding to the third line. In the drawing the dog’s path is indicated by the solid line. 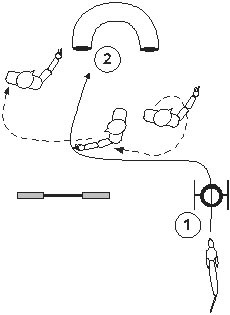 Notice that the handler flips into the Blind Cross before the dog can actually overtake the handler in the initial Front Cross. The Flip compels the dog to turn two distinct corners, and draws the dog towards the handler’s position. It is a marvelous tool for solving simple discrimination problems. On the face of the movement, it looks like a simple 360º turn. That’s not exactly true. It’s actually a 270º turn, followed by a 90º turn. It’s unfortunate that those two numbers add up to 360. This is a very business-like movement. The handler must move convincingly and without any sort of hesitation, because it is the movement that turns the dog. 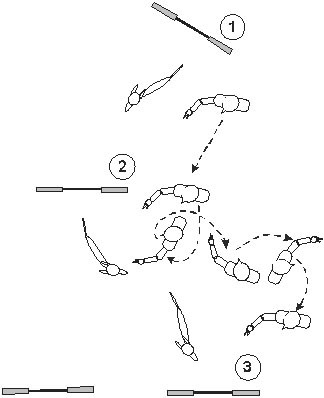 In this illustration the handler’s cue to begin the first element of the Flip, the Front Cross, is the dog coming up through the tire. The cue for the second movement is the dog turning and moving in the direction of the handler. The Flip is also a very powerful tool for tightening a dog’s turn. This is great for the very ballistic dogs, as the handler’s movement is very compelling. The rotation of the handler’s body might actually be very tight, nearly a pirouette (and nearly a 360º turn.) Yet the handler should not lost sight of the fact that it is two distinct movements, each with their own cues and objectives. When the two are put together back-to-back the handler’s movement and the effect on the dog can be a thing of grace and beauty, a moment of poetry. I have distinct criteria for whether I would use a Flip to solve a riddle rather than an RFP. The RFP is a movement in which the handler wants to be very precise and maintain a control position. The Flip is to the RFP as the Blind Cross is to the Front Cross… the Flip is a racer’s movement meaning that the handler has a compelling interest to race the dog. What a novel concept in these times of micromanagement! And in the same way that the Blind Cross is kinder to old knees than is a Front Cross, the Flip is kinder to old knees than an RFP. A single Cross is a grind against inertia so the double-cross of the RFP is a double-grind against inertia. This entry was posted on December 16, 2014 at 4:35 pm and is filed under Dog Agility Training, Handler Training. You can follow any responses to this entry through the RSS 2.0 feed. Both comments and pings are currently closed. It’s called the “cookie fist” at our club by the one trainer who actually teaches it in his classes. Seriously.